Give your church, school, or organization the adventure of a lifetime by organizing a project through Maranatha! Maranatha helps church and school groups organize their own mission trips, and there is no fee for our service. We match private groups to one of our project locations, depending on group size and schedule, and we share our expertise in developing a spiritually experience project. From developing budgets to choosing safe and comfortable lodging, Maranatha can help volunteer teams with every aspect of project planning. Once at the mission site, we’ll even connect you with our in-country staff for additional support. We call these mission trips “Group Projects.” While they are closed to the public, anyone can create a project through Maranatha. Determine whether you have a minimum of 20 volunteers who are willing to participate. The size of your team will affect where you go and what kind of project you do. Contact Maranatha to discuss options, and then select dates and location. Set a project fee per volunteer, based on your total budget (excluding travel costs). Finalize participant list and help to fundraise for the project. Have every volunteer pay the participation fee to Maranatha, 30 days prior to the project. When your team arrives for the project, our in-country volunteer coordinator will be there to support you throughout the project. 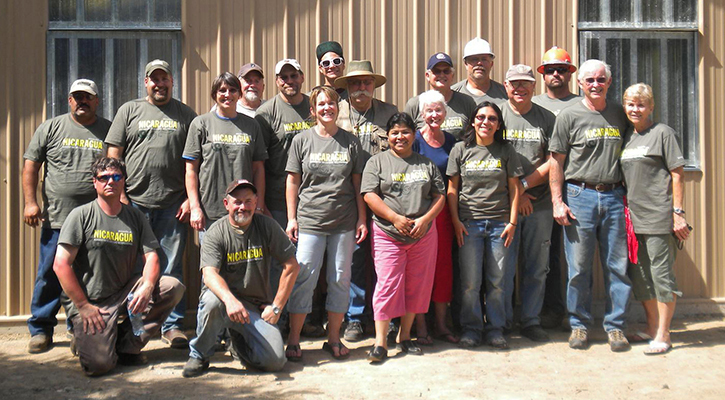 Your work site will have all building materials ready for your team to begin, along with a trained Maranatha crew to help as necessary. Maranatha relies on the generosity of donors to fulfill the requests for churches and schools. Sometimes, funds for projects are not in place before we begin construction, and Maranatha must work on faith. Some teams choose to assist with the costs of construction by raising money for the very project they build. We realize that not all teams are able to do this, but we appreciate every effort! It makes a huge difference! Funding amounts vary by project location. If you are interested in fundraising for a building, please let us know.